There’s an abundance of excellent entry level visual scopes — superbly built, brilliant optics, dazzling computerized interfaces, GPS time/location services, and tomes of eager eyeballs to peer through them. 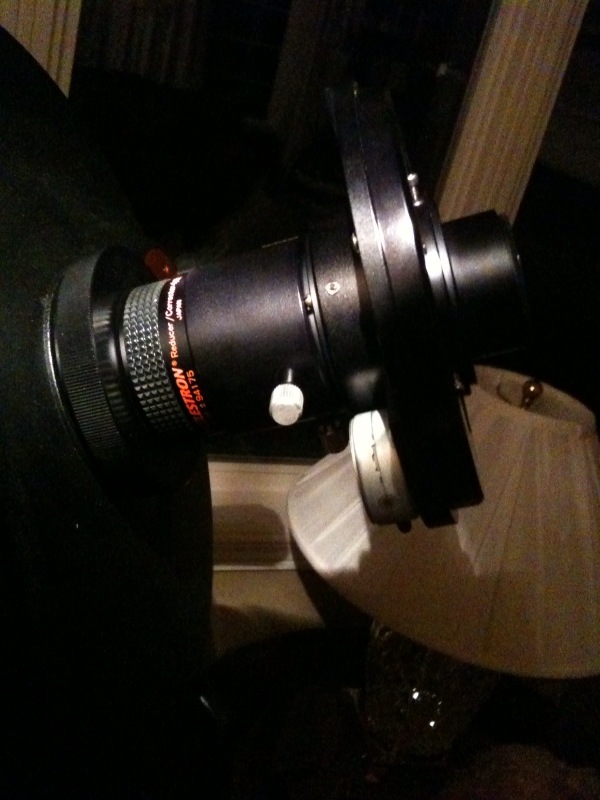 Of course as you probably are aware, I’m speaking of none other than the Celestron CPC 1100. Of course, there are many others in this same category from other manufacturers, but this project aims to achieve one objective: Stellar long exposure imaging without breaking the altaz mount (although we might break the bank in trying). How’d this come to be? An eager gazer buys their mount, runs around looking at many exciting objects, and curiously decides it is time to begin astrophotography with their already-owned DSLR camera. T-Ring adapter here, extension tube there and blam, image away. But then some unexpected problems creep in. Stars begin to trail and look like streaks. Fields begin to rotate. Stars at the edge of the picture don’t look so much like stars anymore. When you ask about what’s happening, you’ll get a few responses – “get a wedge”, “get a mount”, “get a focal reducer”, “hyperstar”, or of course the extra entertaining “get a new scope”. But, there are other options. This project is about trying to build an amateur version of the same stuff the monster professional telescopes use: field derotation and reliable autoguiding on an altaz mount. A quick glance at the List of largest optical reflecting telescopes shows some pretty giant sizes — 10 meters or more. Imagine trying to mount a 10 meter reflector on an equatorial mount. There are many challenges we face with this project that are not obvious at the start. Things like backfocus begin to creep in as issues as you extend the length of your imaging train. And we have other, more subtle issues, such as autoguiding challenges. And of course cost — this won’t be the cheapest solution out there, either. 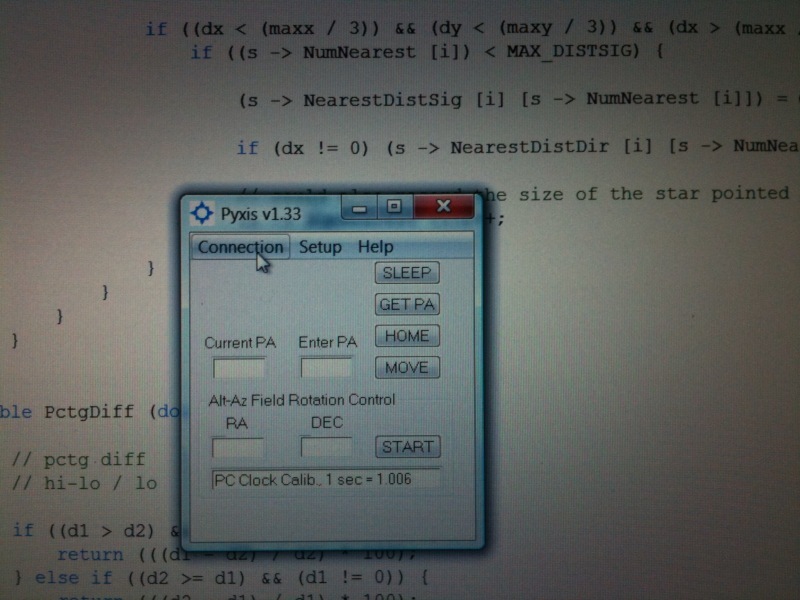 The first problem to be examined is that of field rotation. The issue here is simple: stars will not appear to move waltz across the sky in a straight line, but rather they will appear to rotate around the North Celestial Pole as well. Meade has a Field Derotator available, which seems to get poor reviews. And recently, Orion introduced the SteadyStar with Rotator that claims to solve this problem. Mind you, it solves a host of others as it also has an Off Axis Guider with Adaptive Optics – much more than just derotation. And finally, there is the solution I ended up with, the 2 inch Pyxis Rotator. There is also a 3″ version available that is a bit thicker and offers better resolution (more gear steps), but for my needs this is enough. Generally, the Pyxis is used as a camera rotator: rotate the camera to a specific angle such that one can frame the image however they want. However, the alternate use is to rotate the camera very slowly based ont he object we are observing. This has the effect of compensating for the rotation of objects through the sky. There is a small utility software that comes with the Pyxis where you enter a host of information such as your Lat/Long, and of course the RA/DEC of the item you want to image. Unfortunately, the RA/DEC is not in the typical “hour/minute/second” format, but rather in decimal format. Fleming Astrophotography offers a simple RA/DEC excel converter to help you along if you don’t have this feature already built into your software. Connecting the Pyxis to your scope and camera is a bit like trying to find the right piece of wood to make an arrow. There are a lot of branches in the forest of different shapes and sizes, but you need to pick out the exact right ones or it won’t quite work correctly. There are a few suggestions on Optec’s website, but talking to a sales rep will probably save you some guessing grief. Generally the next thing in the stack would be a filter wheel, followed by your camera. Again, the back of the Pyxis can host a variety of different sized adapters so it’s important to make sure you are getting the right one for your camera. I found it extremely challenging to get the autoguider camera properly focused on much of anything since it’s not parfocal with the main imaging camera. Some cameras, such as those from SBIG (XCM’s) include a separate guide CCD at the same plane as the main imagine camera which can then be used for guiding inputs. Still other solutions can do clever binning and chose a subset of pixels on the main imaging camera to be used for autoguiding purposes. All of these have one major problem though: The output of most autoguiding solutions on the market today output to an ST-4 port and use a mechanism called ‘PulseGuide’ in order to move the scope. 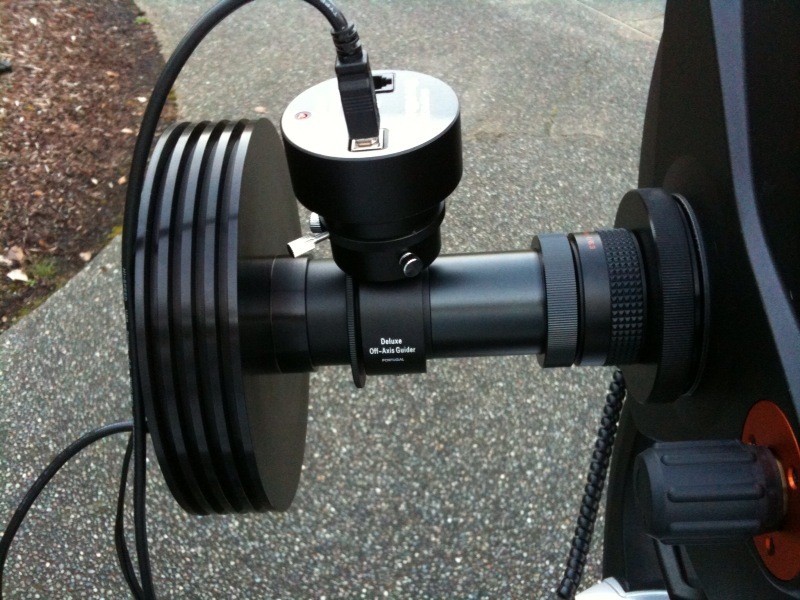 Generally, autoguiding on an equatorial mount only requires movement for one motor. However, an AltAz mount has two separate motors which need to be controlled. And to top it all off, the ASCOM drivers and Nexstar handset do not support PulseGuide while mounted in AltAz. Oops. Here’s where things begin to get much trickier. The closest thing I have found for this would be to use soemthign such as PHD Guiding and another tool called GuideMate. GuideMate is a simple application that sits on top of an open window (presumably one with your guiding camera output) and then you can manually guide via the hand control. This isn’t quite autoguiding, but the concept has merit. The current plan is to capture the Window with PHD Guiding running, extract the camera output, analyse it for movement, and then send to the hand controller via the RS232 port the appropriate commands to move the scope. 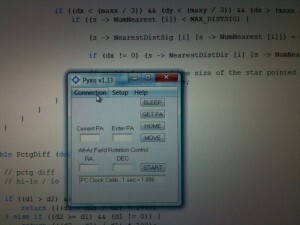 You can find the source for Visual Studio 2008 to an extreme prototype at http://www.astrokev.com/AltAzAG/AltAzAg-0.01.cpp As this software is further developed, I’ll continue to post additional updates here. This entry was posted by admin on May 16, 2010 at 5:16 pm, and is filed under AltAz Imaging Project. Follow any responses to this post through RSS 2.0.You can skip to the end and leave a response. Pinging is currently not allowed.